﻿ Subterranean Termite protection using Termidor termite defense. 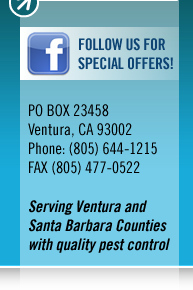 Treat your home for termites from Shoreline Pest Control in Ventura and Santa Barbara counties. Made from a revolutionary new technology, termites can’t see, smell, taste or avoid Termidor. Instead they contact, ingest, and share it with their nestmates. It’s superior to older liquid termite controls, which rely on repellent barriers that termites can too easily avoid. Holes are drilled approximately every twelve inches around the perimeter of the concrete slab. Termidor is injected into the soil under the slab. Then the holes are expertly patched. A trench approximately six inches deep is dug along the foundation of the structure. The trench is then filled with Termidor. The Termidor is absorbed into the soil which can take several minutes. After the soil has absorbed the treatment, the trench is refilled with soil. Termidor is Non-repellent and termites will avoid it. The Termidor use takes time, allowing more termites to come in contact with it as they pass through the chemical barrier. Small holes drilled through slabs and floor coverings as needed. Every precaution is taken to ensure a clean application, though plants may be damaged where trenching is required. There are instances where Termidor has not been proven to eliminate an entire colony in one application.